Context: Mycotic keratitis presents as an ophthalmic problem causing visual disability due to its protracted course and unfavorable response. People of low socioeconomic classes who often come in contact with fungal spores during day to day activities suffer from this infection more often. Aims: To study the magnitude of fungal corneal ulcer, identify the risk factors, identify the predominant etiological agents in this region. Settings and Design: Type of study—observational study. This was a cross-sectional hospital based study. Materials and Methods: We collected 50 number of corneal scraping samples from patients clinically suspected to have fungal corneal ulcer within the age group 15–60 years. Direct microscopy of 10% potassium hydroxide (KOH) mount, gram staining, fungal culture on Sabouraud Dextrose Agar (SDA) media were performed. Results: Fungal isolates were obtained in 32% of cases of which 68.75% were male. Predominant age group was 30–45 years (56.25%). Majority of patients (68.75%) belong to low socioeconomic class. The most common risk factor was trauma with vegetative matter in 62.5% of cases. Predominant fungal isolate was Aspergillus spp. in 43.75% followed by fusarium, candida, and curvullaria spp. 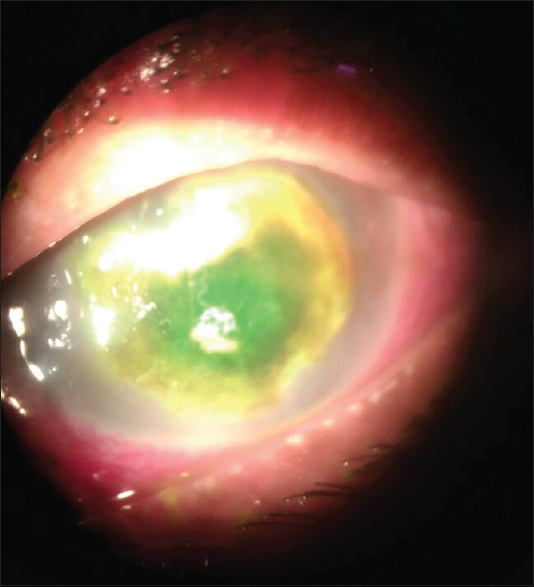 Conclusions: Because of the serious consequences of infectious keratitis, it is important to know the exact etiology to institute appropriate therapy in time. Laboratory confirmation should be under taken to rule out fungal infection before prescribing corticosteroid and antibacterial antibiotics. Microbial keratitis is an infectious disease of the cornea that is characterized by inflammation, often with stromal infiltration by leukocytes and an ophthalmic emergency requiring immediate attention. It is an important cause of preventable blindness. All kinds of microorganisms like bacteria, viruses, fungi, and protozoa can cause keratitis leading to corneal ulcers. Keratitis caused by fungi presents as corneal ulcers with an indolent course, stromal infiltrate with a dry texture, feathery boarders, satellite lesions, immune ring infiltrates, and unleveled hypopyon. Keratomycosis occurs in areas with warm climates and its incidence increases with seasonal increase in temperature and humidity. Trauma by vegetative or soil matter seems to be the predominant risk factor. Injudicious use of tropical corticosteroids and other antibacterial agents for external ocular disease and contact lens use further enhances the risk. A total of 105 species of fungi, classified in 56 genera have been identified as the etiological agents of fungal Keratitis and Fusarium spp. and Aspergillus spp. are responsible for 70% of cases. India being a tropical agricultural country has a higher prevalence of fungal keratitis. The incidence of fungal keratitis lies in the range between 25.6% and 36.7% in various parts of the country. Odisha being in subtropical region has favorable environment for fungal growth. Given the relatively high burden of fungal corneal ulcer, its associated morbidity and the variation in etiological agents, risk factors from place to place, assessment of fungal corneal ulcer seems to be need of the hour. After obtaining approval from the institutional ethics Committee this study was conducted for a period of 3 months. This includes 50 patients with clinically suspected fungal corneal ulcer within an age group of 15–60 years. Sociodemographic data, chief complain, history of present illness like onset, duration, associated features, aggravating or relieving factors were noted. Corneal scraping of the affected eye was collected under slit lamp illumination [Figure 1]. The direct microscopy of 10% potassium hydroxide (KOH) wet mount and gram staining of the materials directly smeared on the slides were performed. The samples were also inoculated onto Sabouraud Dextrose Agar (SDA) plates for fungal culture at 27°C for 21 days. 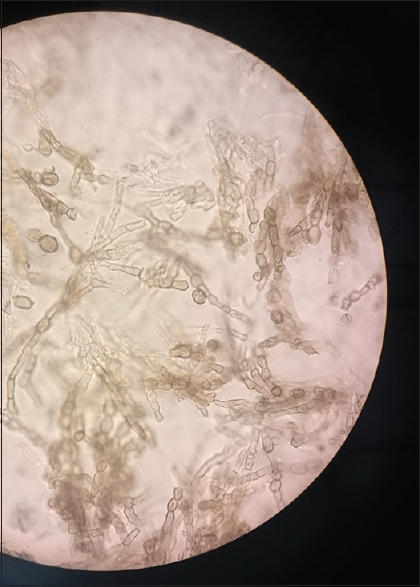 Fungal growth was identified by macroscopic features like growth rate, texture of the colony, and color on obverse and reverse in SDA media. For filamentous fungi a subsequent slide culture was done which were then stained with lactophenol cotton blue an identified by its microscopic morphology. Yeast isolates were identified by microscopy with gram staining, negative staining, germ tube formation, and growth in cornmeal agar. A total of 50 patients examined for fungal corneal ulcer of which 16 patients (32%) were confirmed to have fungal infection. Of the confirmed cases, 13 were both culture and KOH positive whereas three cases were only KOH positive [Figure 2]. Out of the total 16 cases, 11 (68.75%) were males. The predominant age group affected was 30–45 years (56.25%) followed by 45–60 years (37.5%). Majority of the patients 68.75% belonged to low socioeconomic classes, 25% belongs to upper lower class, 6.25% belonged to lower middle class whereas no patient belonged to upper or upper middle class based on Kuppuswamy's socioeconomic classes. The most common associated risk factor was trauma with vegetative matter (62.5%) followed by use of herbal medicines for any ocular complain (12.5%), use of topical corticosteroids (12.5%), use of topical antibiotics, and contact lenses each 6.25%. The predominant fungal isolate was Aspergillus spp. in seven cases accounting for 43.75% followed by Fusarium, Candida albicans, and Penicillium spp. that was isolated from 4, 2, and 2 cases respectively accounting for 25%, 12.5%, and 12.5% of infection respectively. Of the 16 isolates, one (6.25%) was identified as Curvularia spp. Odisha lies in the tropics with a climate and humidity that best suits the fungal growth. Majority of population survive by agricultural work. Such a scenario seems to justify the magnitude of mycotic keratitis that is found by this study which was 32% of the suspected cases. The study similar to other studies on mycotic keratitis done in other parts of India found that males (68.75%) outnumbered female because being involved in outdoor agricultural farming activities.,, The commonly affected age group was the physically active age group, i.e., 30–45 years who worked outdoors as farmer, laborer, etc. People of low socioeconomic classes who were generally farmers and laborers often come in contact with fungal spores during their common day to day outdoor activities which increase their susceptibility to fungal infection. In this study, most of the patients those were confirmed to have mycotic keratitis were of low socioeconomic status. Due to their poor status and literacy they are ignorant and report to OPD late. Trauma with vegetative matter like crop, fuel wood, paddy straw, and tree branches was the key antecedent factor , which was also the predominant risk factor (62.5%) in this study. Application of herbal medicines and other self-prescribed treatments like application of various oils, honey, and cow milk to the eye on trauma or foreign body sensation was also reported. Few cases had a history of therapeutic contact lens use unlike previous report, as majority of our patients belong to rural background., In those cases, constant irritation of cornea by lens and lack of hygiene seems to predispose the patients to fungal corneal infection. Of the 16 cases, three were culture negative yet KOH positive.,, This might have been because the samples were collected from patients that came for follow-up and were on antifungal drugs already. The predominant etiological agent of mycotic keratitis in this region was Aspergillus spp. followed by Fusarium spp.,, One patient presented with diffuse brown pigmented corneal ulcer which gave growth of Curvularia spp. In North India, the most common cause was Aspergillus spp. Other studies from North and Western India also report Aspergillus spp. as most frequent cause of mycotic keratitis (41%) and (46%), respectively. However, Fusarium spp. was found in South India. Fungal infection of the cornea continues to be an important cause of ocular morbidity mostly in males inhabiting rural area and involved in outdoor agricultural activity. If strong clinical suspicion of fungal keratitis exists, KOH mount and gram staining are useful in diagnosis in resource poor setting. Karsten E, Watson SL, Foster LJ. Diversity of microbial species implicated in keratitis: A review. Open Ophthalmol J 2012;6:110-24. Jones BR. Principles in the management of oculomycosis. Am J Ophthalmol 1975;79:719-51. Insan NG, Mane V, Chaudhary BL, Danu MS, Yadav A, Srivastava V. A review of fungal keratitis: etiology and laboratory diagnosis. Int J Curr Microbiol App Sci 2013;2:307-14. Gajjar DU, Pal AK, Ghodadra BK, Vasavada AR. Microscopic evaluation, molecular identification, antifungal susceptibility, and clinical outcomes in fusarium, aspergillus and, dematiaceous keratitis. BioMed Res Int 2013;2013:605308. Kumar N, Sekhar C, Kumar P, Kundu AS. Letter to Editor. Indian Journal of Paediatrics 2007;74: 1131-2. Nath R, Baruah S, Saikia L, Devi B, Borthakur AK, Mahanta J. Mycotic corneal ulcers in upper Assam. Indian J Ophthalmol 2011;59:367-71. Mohd-Tahir F, Norhayati A, Siti-Raihan I, Ibrahim M. A 5-year retrospective review of fungal keratitis at hospital university sains malaysia. Interdiscip Perspect Infect Dis 2012;2012:851563. Gill PK, Devi P. Keratomycosis – A retrospective study from a North Indian Tertiary care institute. J Indian Acad Clin Med 2011;12:271 3. Chander J, Singla N, Agnibhotri N, Arya SK, Deep A. Keratomycosis in and around Chandigarh: A five-year study from a north Indian tertiary care hospital. Indian J Pathol Microbiol 2008;51:304-6. Galarreta DJ, Tuft SJ, Ramsay A, Dart JK. Fungal keratitis in London: Microbiological and clinical evaluation. Cornea 2007;26:1082-6. Leck AK, Thomas PA, Hagan M, Kaliamurthy J, Ackuaku E, John M, et al. Aetiology of suppurative conrneal ulcers in Ghana and South India, and epidemiology of fungal keratitis. Br J Ophthalmol 2002;86:1211-5. Saha S, Banerjee D, Khetan A, Sengupta J. Epidemiological profile of fungal keratitis in urban population of West Bengal, India. Oman J Ophthalmol 2009;2:114-8. Shokohi T, Nowroozpoor-Dailami K, Moaddel-Haghighi T. Fungal keratitis in patients with corneal ulcer in Sari, Northern Iran. Arch Iran Med 2006;9:222-7. Sharma S, Srinivasan M, George C. The Current Status Of Fusarium Species In Mycotic Keratitis In South India. Indian J Med Microbiol 1993;11:140-7.